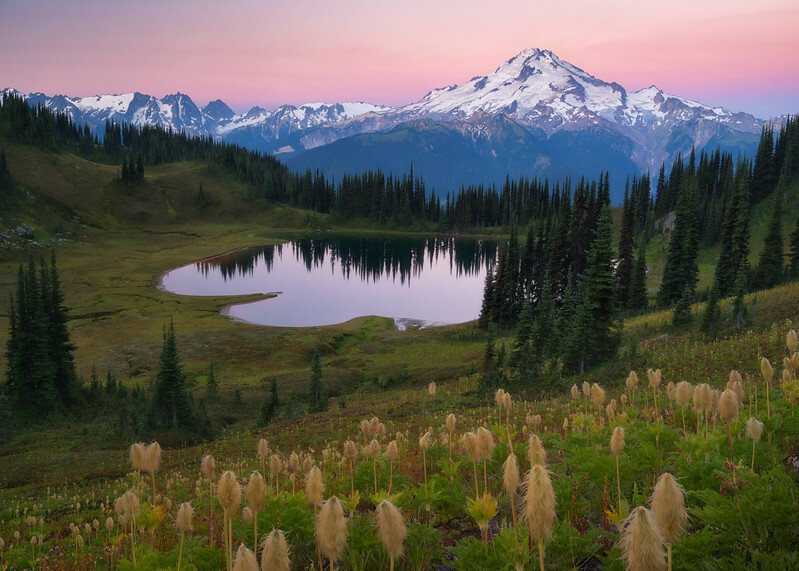 Beautiful pasque flowers gone to seed and Image Lake awaken to a rosy sunrise underneath Washington's most remote volcanic peak, known by the Suak Indian Tribe as "Tda-ko-buh-ba", but also known as Glacier Peak. This location in the Glacier Peak Wilderness comes as close to heaven on earth as anything my imagination can possibly conjure up. Looking out across the meadow and lake to Glacier Peak one feels the pure essence of a wilderness area, an area where the earth and its community of life are untrammeled by people, and where we are just visitors who cannot remain in a place of such unspoiled beauty. Image Lake is not very accessible and I approached the lake as part of an extended 7 day backpacking trip with the Sierra Club. Our route took us up and over Spyder Gap's Lyman Glacier, scrambling down into the Lyman Lake Basin, up and over Cloudy Pass, over to Image Lake, and out through Flower Dome and Buck Creek Pass-about a 60 mile loop trip including side trips. This is a focus stack of 6 images taken at F11.